Is it weird that when I saw people posting their 2016 Best Nine I got strangely giddy? Apparently I was super excited for this. My 9 pictures that were most liked on my Instagram (@ceeceesparkles) were really random, but all good memories. 2016 was a good year for my clan. And for those who have asked, if you go to 2016bestnine.com and put in your Instagram handle – you can see your top 9 too! I apologize if a lot of my posts recently have been about 2016 – but its the end of the year and I feel like these posts are my way of wrapping up the year! Its kind of all I’ve been thinking about lately so naturally its what I’d be blogging about I guess. As I have been looking back at the year and making goals and deciding on changes I want to make to my life in the coming year I’ve started to realize that I have really learned a lot in 2016. I know each year teaches you a thing or two but I have learned so much this year. Wow. 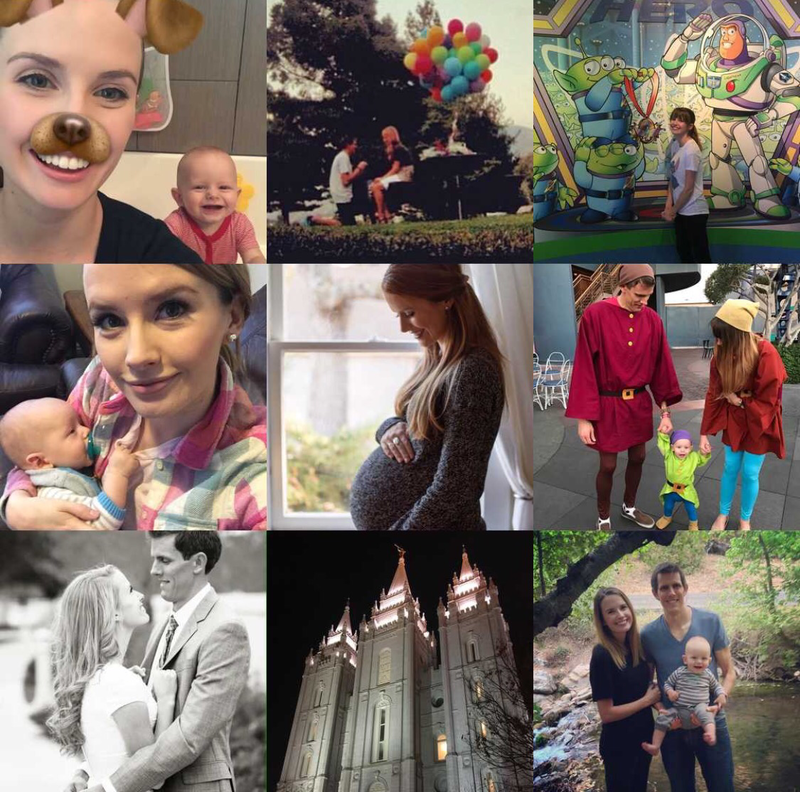 I’m sure a lot of this is because when 2016 started I was a very new mom with a sweet two month old baby boy – and if you didn’t already know, being a mom and raising a child teaches you A LOT! The thing I think I have learned the very most this year is definitely patience and faith in the Lord and His plan. I am a worrier of the highest degree and having my perfect baby boy has only made me worry 100% more. I’m sure so much of this has to do with the anxiety that consumed me in full force once I got pregnant, but I’m just far too good at imagining the worst case scenario or letting my mind wander and come up with these scary, awful situations. Whats funny about this is I feel like I am typically a glass-half-full kind of person, but when it comes to this I can spiral downward pretty quickly. Prayer has been my greatest ally in all of this. I don’t know why it took me so long to figure out that I functioned a lot better when I prayed immediately when I started to feel even the smallest inkling of anxiety, fear, worry, panic, etc. Thats not to say that there aren’t some days where I don’t still flip out, but I have learned that prayer really works! And I knew that… But this year I learned this in a whole new way and I can say that my testimony of prayer and God’s love for me has grown so, so, so much. Because I can pray to my Heavenly Father I am given comfort, guidance, I am able to help accept things and my worries and anxiety are muted. I’m so grateful for this lesson. I have learned in a way I’ve never known before that if I strengthen my faith in Heavenly Father and His plan, then I know I will be ok. Even if I don’t fully understand it all – I just know. I have also learned a lot about priorities. Before having a baby somehow priorities weren’t that important. I knew Wild Man was at the top of my list and that our families were super important to us, but because it was just the two of us – two adults – I feel like we could bounce around and do lots on a whim. Now that The Captain has joined our family I have seen the importance of my role as a mother. He is still so young and it is my job to give him structure, nurture him and always keep his best interest in mind. Wild Man and I have sacrificed a lot this year, but it was for the benefit of our son. And you know what? I honestly don’t regret it. Knowing my child is happy, cared for, loved and safe is a huge blessing to me. I’m not completely sure how exactly I learned this, but I also figured out that its ok to be myself and fully embrace who I am. If I like something someone else doesn’t like, thats ok. If my opinion is different than someone else’s opinion, thats ok. If I want to do something in my own way and its not the norm, thats ok too. Its been very freeing accepting that I am who I am and I can be the version of me I want to be and don’t have to worry about what other people think. Of course there are still those days where I really care about what others think – but I’m working on this every day. The last thing I want to touch on is something thats really driven me. I have learned a lot about my own value. I am capable of a lot and there isn’t anything stopping me from achieving the things I am working towards unless I let it stop me. My personality is special to me and it can help those around me. If I am true to myself, that true-me can be beneficial to my little corner of the world. I am a valuable person who has great potential and is deserving of good things! My heart is feeling very full today as I’m looking back at the year. I’ve learned so much more than just what I’ve talked about and I am so grateful that I was given the chance to learn these things. Now on to 2017 and new life lessons! I’m pretty sure there aren’t even words to describe what a perfect Christmas we had yesterday. To be honest I’m getting teary just thinking about it. Everything went perfectly, so smoothly and having our sweet one year old totally into it made everything so much more magical. I laughed because on Christmas Eve night when I went to bed I realized I felt like a little kid again and could hardly sleep because I was too excited to see H see what Santa brought him and open presents from mom, dad, grandparents, aunts/uncles and cousins. At one point I woke up and thought for sure it was six or seven in the morning and I laid there impatiently waiting for H to wake up because I was so excited to start the day. After a while of waiting I looked at the clock on my phone at it was 1:30am! It was a total flashback of my childhood. Its almost like H knew it was Christmas. He woke up extra happy and was adorable when he walked into our living room and saw everything. He actually had a decent attention span when it came to opening gifts and was really cute and had a few specific toys that he really loved. We had Christmas morning just the three of us for the first time this year and it was perfect. It made the holiday more special and meaningful somehow – and also made me feel like an adult, big time. We spent a little over an hour opening gifts, taking pictures and playing with our new things then we got ready for church. We went to my families ward with them at 9am. I originally had a bad attitude about church on Christmas and now I’m embarrassed I ever felt that way. Hellllllloooooooo? Isn’t that what this holiday is about? Church was only an hour long and it was filled with choir numbers, congregational hymns and one speaker. It was a really neat way to remind me of the spirit that should be in our hearts on Christmas day. It put the day in to perspective for me and honestly because of going to church I felt a different spirit with me throughout the day. After church we went to my parents house for several hours. They hadn’t had their Christmas yet so we were able to join them for all of that which was really fun. I truly think I’ll be kind of sad the day I don’t get to be there to see the looks on my little sisters faces when they open their gifts. We exchanged gifts then pretty quickly started my FAVORITE Christmas tradition – we broke open a bunch of the new games we received and started playing! Games and Christmastime just go together in our family. It was a blast playing games and eating Chinese food. Then we made our way (five houses away) to Wild Man’s families house where his entire family was there for the first time in a few years! We socialized, exchanged gifts, played a couple games, ate a delicious Christmas dinner then played some more games. We got tired but it was well worth it. When we got back home H couldn’t stay awake and went down so good. Wild Man and I looked through the pile of gifts we got and reminisced on our amazing day. Like I said I seriously cannot put into words how great of a day this was. I knew it would be good – Christmas always is – but this was better than I imaged it to be. I hope you all had an equally as amazing day and that no matter who your day was spent with that you felt love and were able to remember the real reason why we celebrate Christmas. December 19: Jesus Calmed the Storm and So Can You: I took this one as lightening someones burden. A family in our ward recently experienced a death and I was able to help them prepare for the funeral and was able to cater to some of their needs. December 20: Jesus Saw Potential in Others and So Can You: I was so excited for this one because this is something I feel like I’m always trying to work on. Its so good to see people for what they can become, rather than view them and judge them negatively. I made a list of the people in my life who I see/talk to/think about regularly and listed several things about them I loved. I also was able to focus on a certain situation in my life where I realized I need to forgive someone. It was an eye opening day. December 21: Jesus Forgave Others and So Can You: Going along with the way I ended December 20th, I continued to work on forgiving people who I realized I’ve held grudges against. Is it bad that sometimes I forget how freeing forgiveness is? December 22: Jesus Showed Gratitude and So Can You: Thank you cards for everyone! Its odd to me how often we (myself definitely included) forget to thank people for what they do and how they act. Its easy, its uplifting and its so, so important! December 23: Jesus Was a Peacemaker and You Can Be One Too: I took this one very seriously. It was also a personal day with this prompt for me. But I will say it left me very inspired to pull out the inner peacemaker in me. December 24: Jesus Cared for His Loved Ones and So Can You: What a perfect prompt to fall on Christmas Eve! We spent time together as our family of three and with each of our families. I tried to be mindful of our family members, let them know I cared for them and loved them, listened to them and had an enjoyable time with them. I was also reminded just how important it is to make sure as a mother I am caring for my husband and son and making them my first and most important priority. December 25: Jesus’s Disciples Followed Him and So Can We: Cue the tears. Why this prompt strikes my heart so much, I don’t know. But I love it. I am a disciple of Jesus Christ, I love Him and I will follow Him. We have church today and as easy as it would be to skip out, we are going because thats where Jesus would be and would want us to be. The New Year is fast approaching and as I’m working on my list of resolutions I want to make sure Christ is at the top of it. I want to live life like He would. I want to make Him proud and do as He would do.